Content marketing is more than just blogging. You need more than great writing to attract, engage, convert, and retain users at the right stage of the buy-cycle. Many marketers will jump in, launch a blog, and hire writers — only to see zero results. We’ve seen, time and time again, that this approach just doesn’t work. What we need is a healthy mix of right and left brained skillsets that empower us to (1) develop a high impact plan, (2) test our theories, (3) execute quickly, (4) iterate constantly, (5) measure results, and (6) repeat successes. Cover your bases, and build the foundations for a rock-solid content strategy by following this step-by-step guide. Conversion funnels diagram the steps that your prospects take to become first-time customers and repeat buyers. These paths are unique, will vary between business models, and can span timeframes ranging from days to months (or even years). Awareness – Audiences become familiar with your brand. Consideration – Audiences research your product by reading your content and connecting with your brand on social media. Engagement – Interested audiences become leads by redeeming offers, downloading ebooks, and signing up for your company’s newsletters. Retention – Existing customers follow the steps of the conversion funnel again to become repeat buyers. 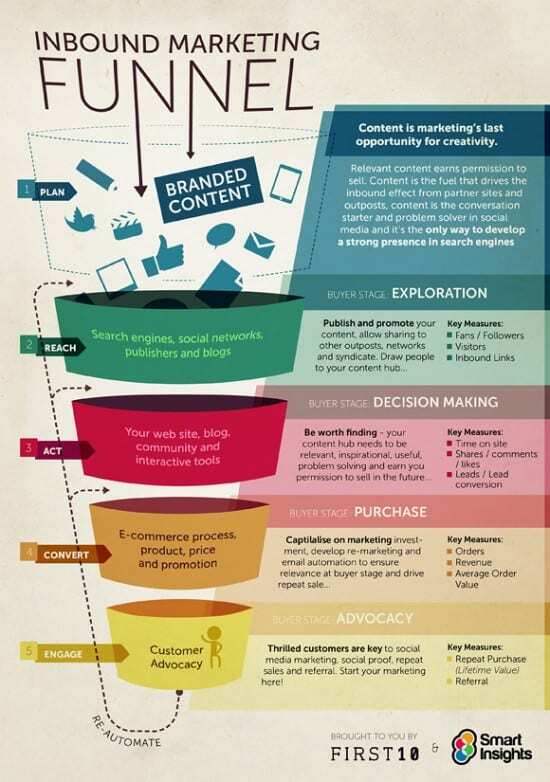 Content marketing is best for funnel stages 1, 2, 3, and 5. You need to make sure that you’re tailoring the content you produce to each step. Let’s look at Coworks, a marketplace that curates creatives from around the world. The team has recently committed to building out its content program. We’ve launched a blog to target early-funnel awareness and mid-funnel engagement opportunities. We are building an email program where users can sign up to receive our content and keep coming back to our site. We are also in the process of launching an e-book to target the consideration phase, targeting business owners who are looking to build remote teams. We are in the planning stages of our program but are relentless about targeting the right stage of the conversion funnel with non-promotional material — our goal is to build awareness, empower prospects with useful information, and nurture those leads into paying customers. That’s a tough question. Content marketing is different from other types of marketing writing in that your goal is to entertain and engage an audience – not sell. Instead of pushing a sales agenda, imagine that you’re on stage. You live and breathe for your audience. 1. Talk to your sales and account management team to ask about questions that your customers are asking. Write content to answer those questions directly. Ask your sales and account management team to send your content to prospects and existing clients. In this case, your content will satisfy the conversion goals of awareness, consideration, engagement, and retention. 2. Browse Quora threads to research discussions in your target market. Answer questions on Quora itself. Here is an example from Karen X. Cheng, founder at 100 — a company that helps people practice a skill for 100 days. She answered a Quora question with links back to her own blog, sending referral traffic back to her website. In this case, your content will satisfy the conversion goals of engagement and conversion. 3. Ask your network to recommend topics. This strategy will help you build an instant rapport with your target audience. Here is an email recently sent to the Coworks community. Write about topics that your users recommend, and then send the blog posts back to them. We’ve said over and over again that content marketing is more than just blogging. In addition to producing blog posts, infographics, whitepapers, and articles. You need to build visibility and connections with your audiences. 1. Share your content with your existing customer base. Ask your sales and client services team to distribute content as part of their core strategies. 2. Guest post on blogs that already have a dedicated audience stream. Here is an example from Anita Newton, VP of marketing at Adknowledge, on the Clarity.fm blog. 3. Ask major publishers or widely read blogs to syndicate your content. Prerna Gupta contributed an article to the Clarity.fm who then syndicated her piece with The Next Web. 4. Develop a PR strategy to promote your content to publications, fellow companies, and other media hubs. This process involves reaching out to journalists 1:1. 5. Hire writers with existing distribution channels. Fellow Position.ly writer Brian Honigman has more than 13,000 followers on Twitter. 6. Use Twitter hashtags to build visibility. I frequently write about business content and join discussions on #entrepreneurship, #startups, #business, and #marketing. Bringing visitors to your website is only the first step. You need to implement lead nurturing frameworks to keep the conversations going and build the relationship over the long-term. Conversion funnels can span a period of months or years. You need to position your brand as a consistent touch point. On Coworks, we encourage platform sign-ups, social media sign-ups, and e-book downloads. We are not aggressive about pushing direct sales — our audiences need the time and space to learn about our business and determine whether our creative marketplace is the right fit. Your forms, offers, and downloads should speak to this question directly. Now comes the fun part. How did your content marketing plan perform? Unique visitors – The number of new people that you’ve brought to your website through content. Repeat visitors – The number of people that you’ve brought back to your website through content. Time on site – A measure of engagement. Goals completed – Could include e-book downloads, new account registrations, or free trial sign-ups. Keyword rankings – Your market share and presence in the search landscape. Google Analytics can help you set up, monitor, and track the user events that are most important to your company’s conversion funnel. Measurement takes up-front planning. Know what you want to quantify before deploying your content strategy. Structure is key. Created a simplified, automated, and repeatable process. The value of a structured content plan will be your company’s ability to learn from mistakes, iterate upon techniques, and grow successful initiatives. It’s possible to tweak any aspect of this stage for better results. Always be testing, and always be learning. It may take some time to get your content strategy off the ground, but don’t be alarmed, as it will bring you closer to your goals sooner or later. Ritika Puri is a San Francisco based blogger who writes about trends in business, internet culture, and marketing. She's inspired by the intersection between technology, entrepreneurship, and sociology.